Hard cover, 77 pages, black and white photographs and illustrations, Index. Text covers early bathing history only. 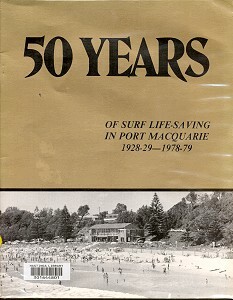 Photographs include Nat Young and Robert Connelly, Bells Beach circa 1967. With assistance from Brian Carr and Joe Debenham. Port Macquarie Printers Pty Ltd.
65 Clarence Street, Port Macquarie, 1979. Soft cover, 53 pages, black and white photographs.